The Flaherty Family Foundation (FFF) employs a philosophy that can best be described through the analogy of a three-legged stool. Each leg of the stool represents the Flaherty Scholar’s support system: their family, their school and the Flaherty Family Foundation. All three must equally and collaboratively work together to support the Scholar. The Scholar sits on top of the stool. Their responsibility, with the support of each ‘leg,’ is to become the absolute best version of themselves possible. It is through education, and the successful execution of a postsecondary plan, that Flaherty Scholars will be career ready and able to attain a financially secure future for themselves and their families. The FFF is committed to their lifelong success. Once a Flaherty Scholar, always a Flaherty Scholar! The Flaherty Family Foundation is based in Minnesota and serves Scholars and families in faith-based, college preparatory high schools not only in Minnesota but also in Maryland, Montana, New Jersey, Virginia and Washington D.C. The FFF has grown from simply offering scholarships to include personalized mentoring and coaching, college visits, funding for summer enrichment activities, career exploration, ACT/SAT prep and a pilot partnership with College Possible. WHO ARE FLAHERTY FAMILY FOUNDATION SCHOLARS? 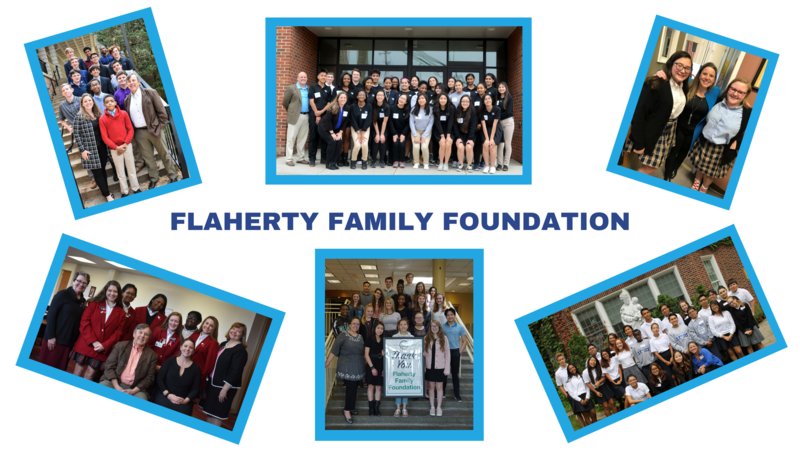 The Flaherty Family Foundation supports scholars of all backgrounds in two primary regions – Region 1 in Minnesota and Region 2 in DC, Maryland and Virginia. Flaherty Scholars are high achievers with strong desires to pursue their dreams, starting with higher education. They are incredibly hardworking, intelligent and resilient young adults who want to make positive contributions to their communities. They are leaders who are committed to taking ownership of their academic path to success. The FFF vision is to have the highest college graduation rate of any control group in the United States and produce valuable leaders who will create lasting impact on future generations. The FFF mission is to provide high school, college prep scholarships to high achieving students with economic need. The FFF also provide Flaherty Scholars with personalized coaching to ensure academic success, graduation with a college degree, and manageable student loan debt upon entering the workforce. The FFF is an educational foundation run by educators. 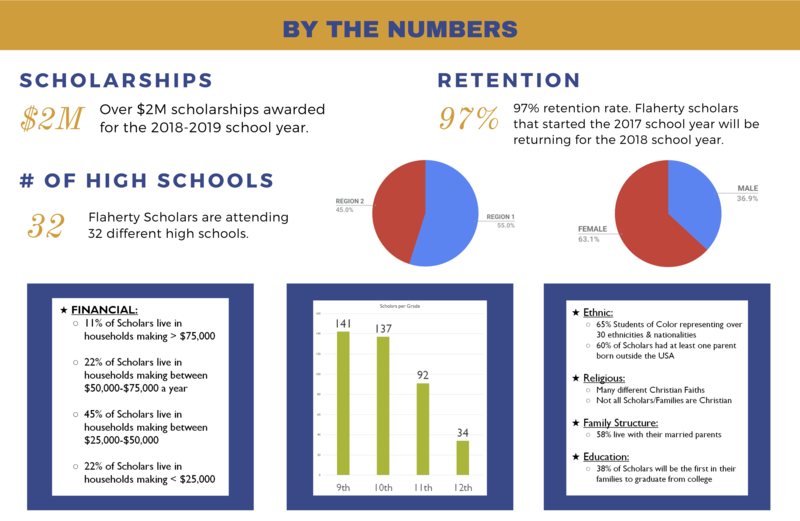 Flaherty Scholars are unique in that they all attend faith-based high schools where their values and morals are being shaped into their experience, right alongside their academic achievement. The level of care, concern and mentorship in personal development for FFF scholars is paramount to their success. • We are HARD WORKERS. • We are HIGH ACHIEVERS. • We PERSEVERE. No obstacle is too great. • We RESPECT ourselves and others. • We work together as a TEAM to achieve our goals. • We practice HONESTY and INTEGRITY within our communities. • We ACCEPT and INCLUDE regardless of race and religion. • We GIVE BACK and ‘PAY IT FORWARD’ so that others may have the opportunities that we have had.